All of this awesomeness happens 9.29 at Charlie's Kitchen. Do we have a night for you?! A jam-packed event is packing into our jam, Charlie’s Kitchen, on Monday, September 29th. The first Treat Yo Self! to be held at the Harvard Square rocker bar (that serves excellent sangria), will feature live music from Sneeze, Onslo (Eye Design Records) and Zip-Tie Handcuffs. You know, that band that melted your face last week? 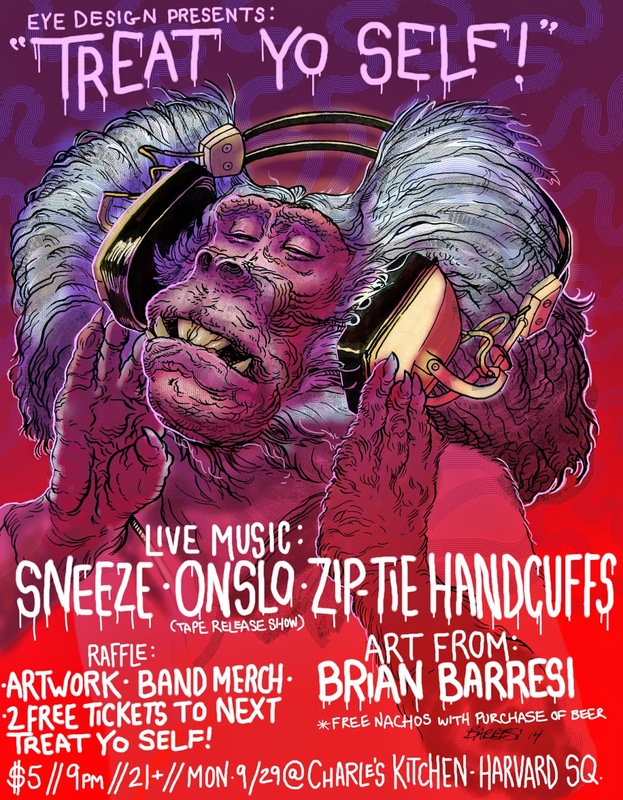 Art from Brian Barresi Art (creator of this snazzy flyer), Kristina Denis Artwork, A RAFFLE because why not, and will celebrate the release Onslo’s S/T album, available on cassette tape at the show. If you’re unreasonably hard to please that’s not enough, Charlie’s will be offering FREE nachos with a purchase of a beer. It sounded too good to be true, so we double checked. It's true. We suggest you get there early for so many reasons, a major one being the max capacity of this room is 83 people. Fact. The second is probably, definitely free nachos. Show starts at 9pm, $5, 21+. Get full details on the official Facebook event page. 2 tickets to the next Treat Yo Self!